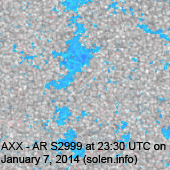 Last major update issued on January 8, 2014 at 05:30 UTC. 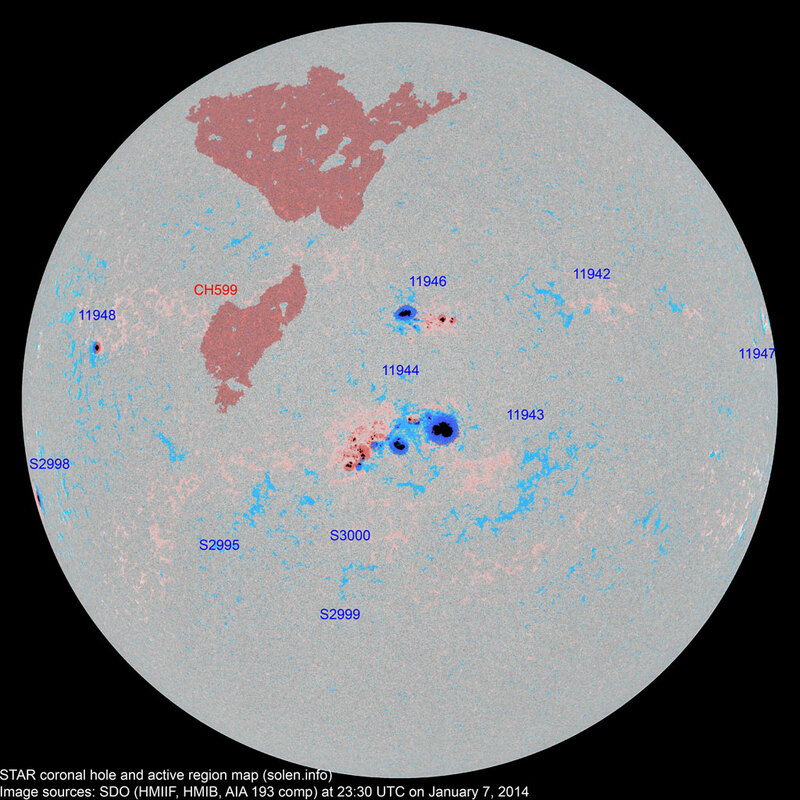 The geomagnetic field was quiet on January 7. 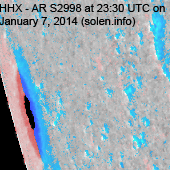 Solar wind speed at SOHO ranged between 325 and 423 km/s. 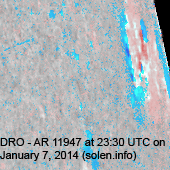 A weak solar wind shock was observed at 14:24 at SOHO, the arrival of the CME observed on January 4. 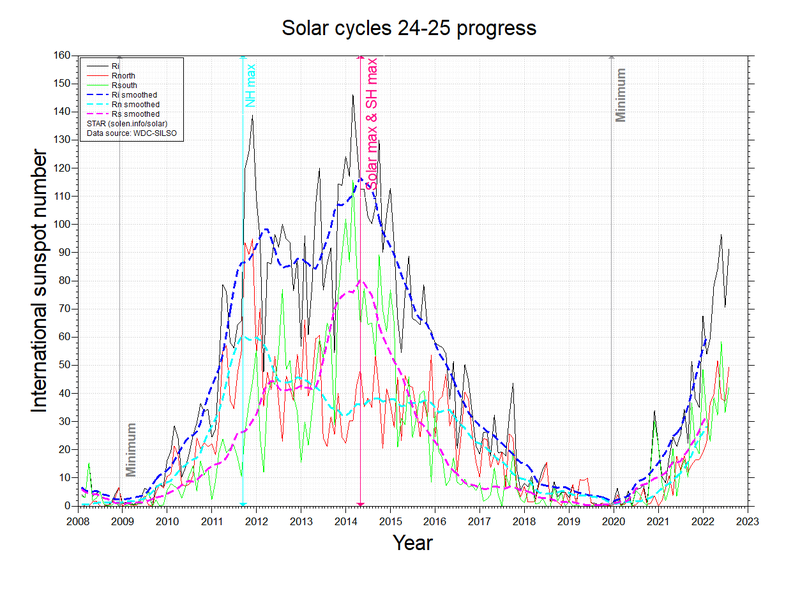 While the IMF was mostly southwards after the arrival of the CME, the total field was unimpressive and consequently caused only a minor geomagnetic disturbance. 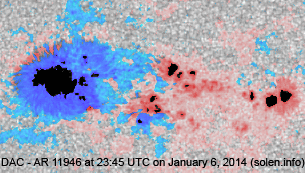 Solar flux estimated at 22h UTC on 2.8 GHz was 200 (increasing 29.2 over the last solar rotation, the measurements at 18 and 20h were flare enhanced). 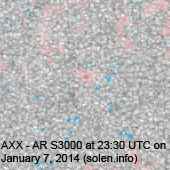 The 90 day 10.7 flux at 1 AU was 146.3. 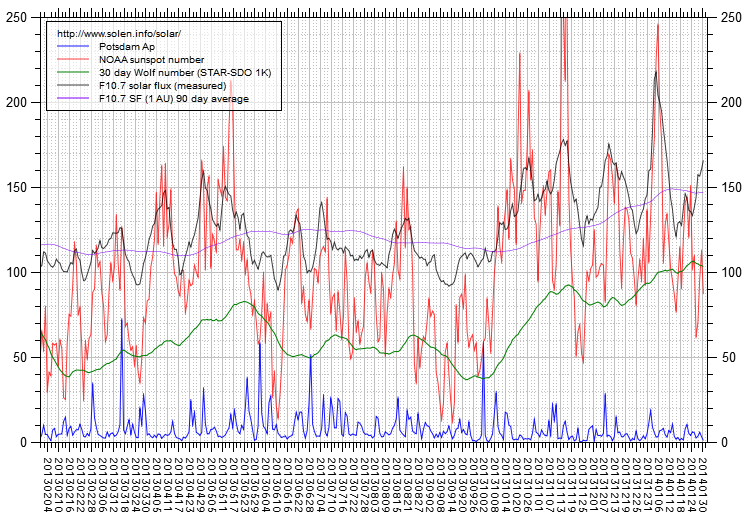 The Potsdam WDC planetary A index was 4 (STAR Ap - based on the mean of three hour interval ap indices: 4.5). 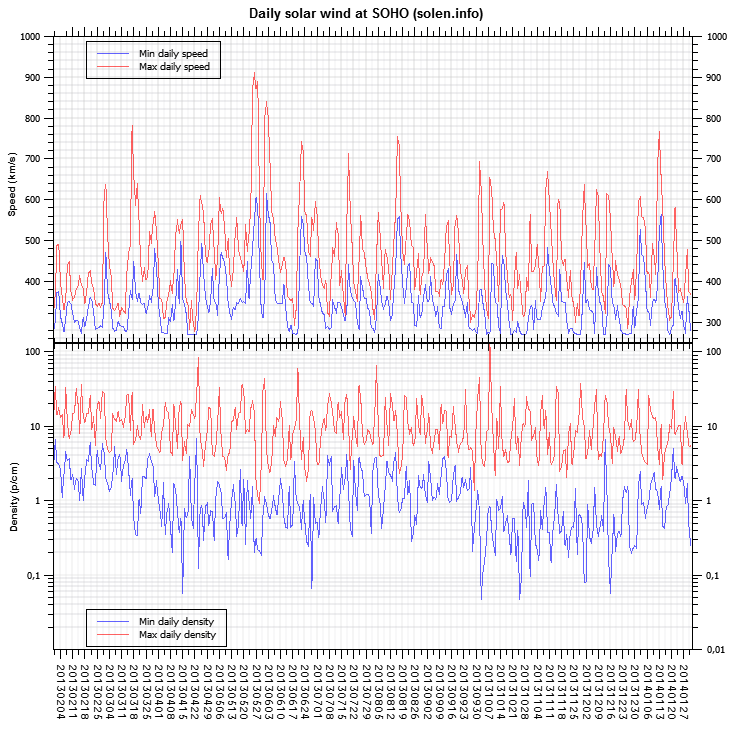 Three hour interval K indices: 01000222 (planetary), 02112342 (Boulder). 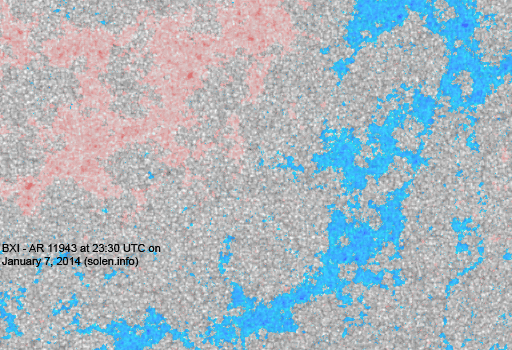 At the time of counting spots (see image time) spots were observed in 10 active regions in 2K resolution (SN: 280) and 9 active regions in 1K resolution (SN: 205) SDO images on the visible solar disk. Region 11942 [N11W33] decayed slowly and quietly. 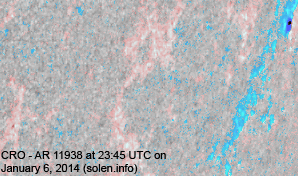 Region 11943 [S14W14] was mostly unchanged. 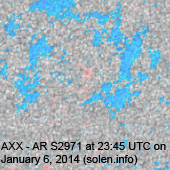 C5+ flare: major long duration X1.2/2N proton event peaking at 18:32 UTC. 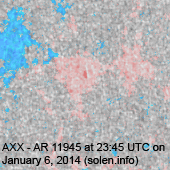 The location of this event was in the trailing polarity section. 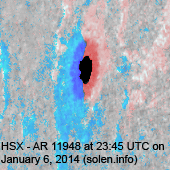 A fast halo CME (exit speed near 2500 km/s) was observed in LASCO and STEREO imagery. 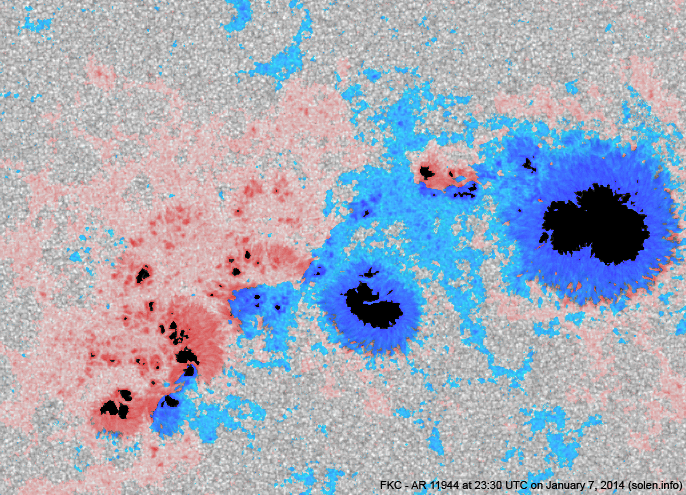 Region 11944 [S09W02] decayed slightly with a minor loss of penumbral area. There are still 3-4 magnetic delta structures. Further major flares are possible. 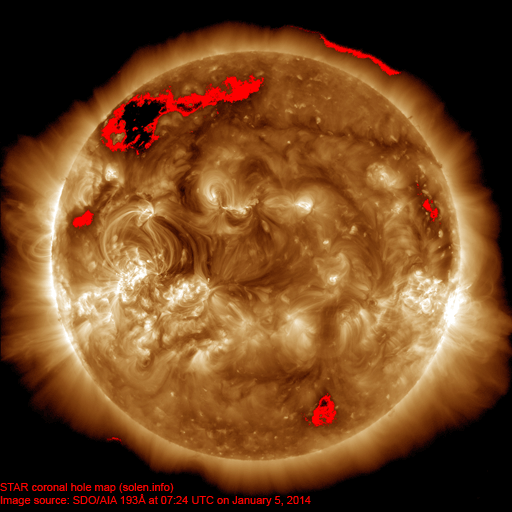 C5+ flare: M7.2/2B at 10:13 UTC. 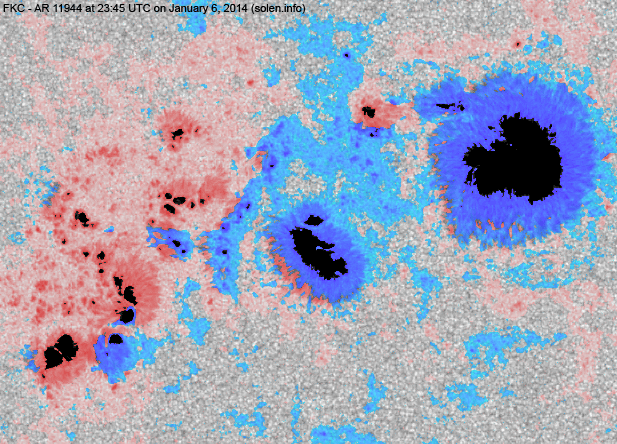 Region 11946 [N09E10] developed further gaining penumbral area and spots. 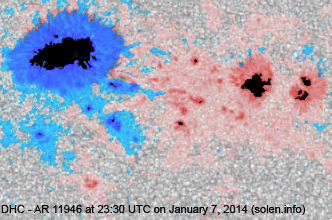 C5+ flare: M1.0/1N at 03:53 UTC. Region 11947 [N11W80] decayed early in the day, then began to develop again. 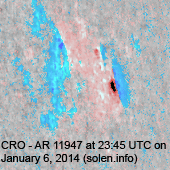 This region was the source of an M3.6 flare at 03:47 UTC on January 8. 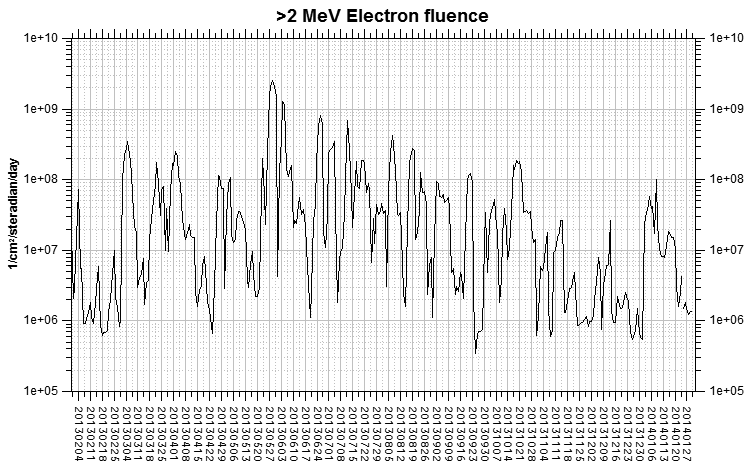 Region 11948 [N06E54] was quiet and stable. 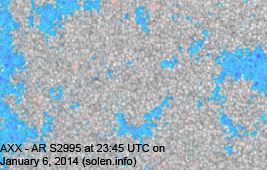 S2995 [S16E23] gained trailing penumbra spots. 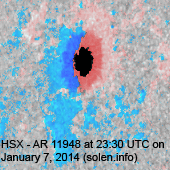 New region S2998 [S15E82] rotated into view. 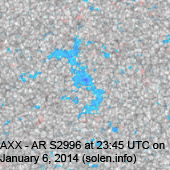 New region S2999 [S32E09] emerged with a penumbra spot. 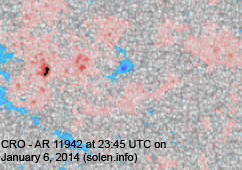 New region S3000 [S19E08] emerged with a penumbra spot. 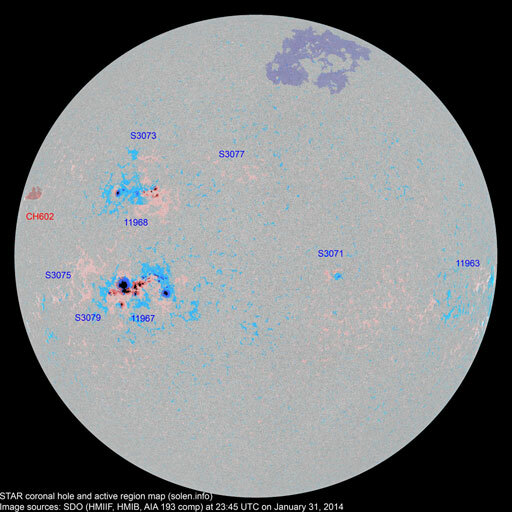 The geomagnetic field is expected to be quiet to unsettled January 8 due to CME effects. Quiet to major storm with a chance of severe storm intervals is likely on January 9 when the Jan.7 CME is expected to reach Earth. Quiet to minor storm is likely on January 10.